In November 2013 Google Earth users began noticing a huge double spiral design etched into the Egyptian desert not far from the Red Sea. The enigmatic pattern is no mystery, though. It’s an incredible art installation created by the D.A.ST Arteam — Danae and Alexandra Stratou and Stella Konstantinidis. It’s an amazing piece of work, although perhaps what is even more amazing is that it took so long for the world to take notice of it. 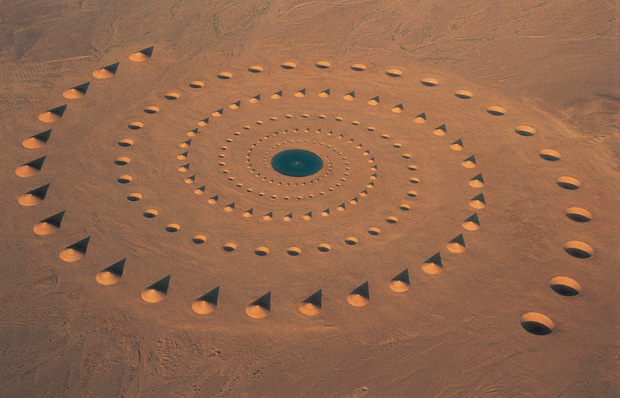 The project, called “Desert Breath,” has been in place since 1997. 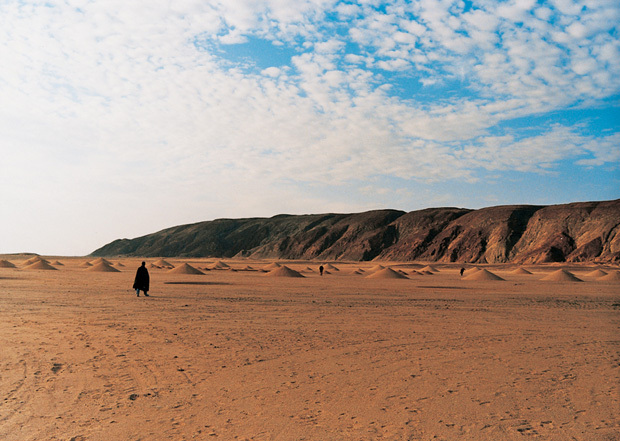 To the artists, the shifting sands of the desert landscape suggested infinity of place and the endless reaches of the mind. 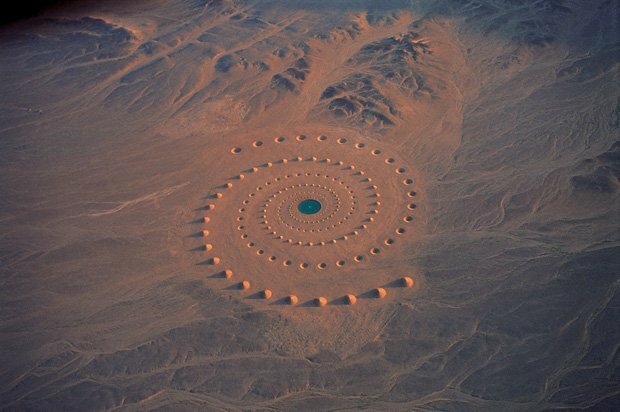 They point out that Desert Breath can be experienced from the air as visual art, and can also be experienced in a more personal way, by walking its spiral paths. There are some other interesting connotations to this incredible work of art and architecture as well. The name “Desert Breath” recalls the ancient Egyptian goddess Sekhmet, whose breath was said to be the hot desert wind. The spiral shapes echo a geometry that’s common to many indigenous cultures — the spiral is often used to represent the cycles of life, or the movement of energies in the universe. It’s also worth noting that the practice of walking a labyrinth is a meditative tradition in many religions and cultures. The double spiral design also closely resembles that of a crop circle, suggesting that the present isn’t nearly as knowable as we assume; and the future contains infinite possibility. Desert Breath was two years in the making. Workers moved 280,000 square feet of sand to create the installation’s 89 raised cones and 89 matching cone-shaped depressions. The geometrically precise pattern covers one million square feet of desert landscape. Watch the artists’ video below to get an idea of the tremendous scale of their project. 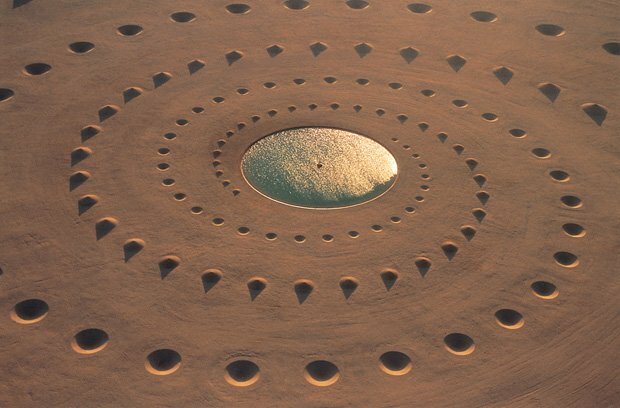 Originally, the center of Desert Breath was a glittering pool of water just under 100 feet in diameter. Over time, however, the water has evaporated, leaving only sand. 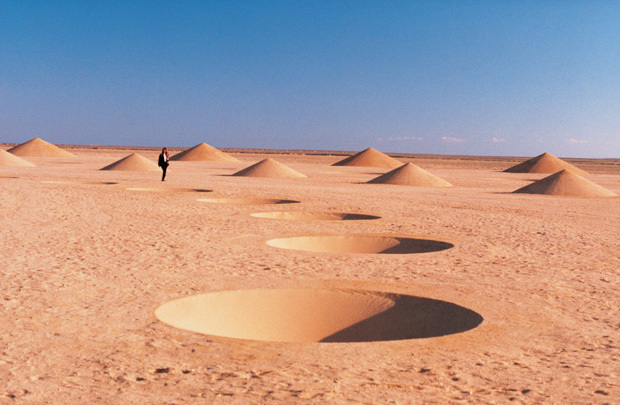 In fact, the entire installation is slowly being disintegrated by the desert wind it is named for. As it levels the raised cones and fills the depressions, the blowing sand is an apt reminder that all is change — and eventually Desert Breath, like all of us, will be gone.